At Dumond’s Custom Furniture, we’re proud to say that each piece of our custom wood furniture is meticulously hand crafted right here in the USA. Using beautiful and unique hand selected wood slabs from around the world, we build natural edge desks like nothing you’ve seen before. Whether you decide to order one of the custom natural edge desks for sale below or you decide to have a custom piece made to fit your personal style, you can rest assured knowing that your new furniture is built to stand the test of time. Handmade 9′ Walnut and Curly Maple Custom Rustic Desk with Hand Carved Ebony Drawer Pulls. Built from urban salvaged wood from Maryland. 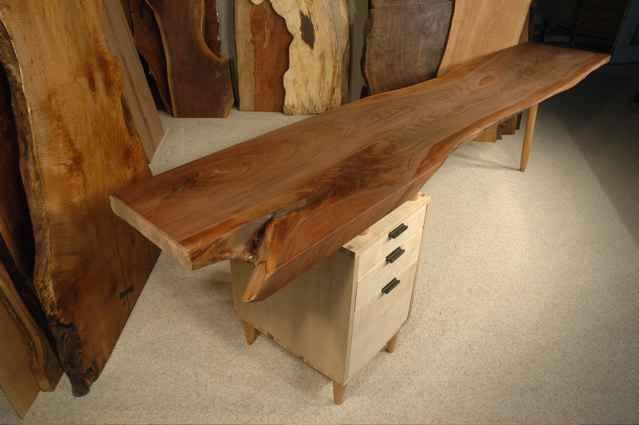 This natral edge walnut desk is a beauty. This desk feels like it wraps around you with the pronounced curve in front of you as you sit behind this desk. Beautiful Maple, highly figured with cedar pedestal base with drawers.